The Best Italian Meal That Wasn't!!! What happens when you mix 95 degree weather, 100% humidity, and a day of cocktails at the pool? I can tell you first hand, you will miss a meal from your favorite restaurant! Key West, Florida, to date, has been one of our favorite destination spots. I believe we visited 5 years in a row. Each year, we made two food pilgrimages. The first was Magnolia's Cafe on Duval Street. Magnolia's is a small dive with the most incredible hamburgers. The grease just drips down your arm! The second, was New York Pizza Cafe, possibly one of the best Italian restaurants I have dined in. We dined there each year we visited Key West. Key West and New York Pizza Cafe is where my story begins! Those that know me, know that I personally feel responsible for the entertainment and well-being of all of our traveling companions while on vacation. Kevin continually tells me I do not need to worry about everyone else's welfare and after this trip, I can honestly tell you I don't anymore! The one bright spot this vacation was going to be the meal at New York Pizza Cafe. Sitting outside under the stars and palm trees. The gentle ocean breezes, the wine, and the hustle of people walking along Duval Street make for a great dining experience. Oh, how I looked forward to that each year! The guesthouse we stayed at each year would host a cocktail hour each evening poolside. Beer and wine for two hours. After the cocktail hour we walked down Duval Street the few blocks to the restaurant. When we got to the restaurant we were seated at our tables and our waiter arrived to take our drink orders. I had been drinking wine earlier so I thought I would continue with wine. Our waiter brought our drinks and took our dinner orders. Since the restaurant was very busy, we ended up having another round of drinks. By that time the damage was done. As we sat waiting for our food, it hit me! The sweat, the slur, and the blur. I went from 0 to loaded in 12.6 seconds. Kevin took one look at me and knew I needed to walk. By the time we hit Duval Street to take a sobering stroll, it hit me. I had an emotional breakdown! There in the middle of the street and hundreds of people I began to cry. I am not talking a few sniffles but the full blown sobbing! Julie McCoy could not take anymore! I had hit the breaking point. This episode would go down in history as one of my best drunken crying jags. I cried non-stop (seriously) until 1 in the morning until I cried myself to sleep. Needless to say, the one thing I looked so forward to did not happen. Eventually, our friends did bring our dinners back to the room when they were done eating but I was not having any. I couldn't, I was passed out. To this day, I can not tell you what I ordered. Kevin, thank you for patiently sitting there listening to me babble. I am sorry you missed the rest of the planned events that evening. That was our last trip to Key West and not the way I wanted to remember that trip. Not by a long shot! Remember, while on vacation make sure you don't worry about whether or not the others in your group are having a good time. Because you will miss...the BEST Italian meal....that wasn't! After all, it is all about the food, right? I found this recipe in the cake folder of recipes on my computer. I have no idea where this was originally from. I made this cake as written. The cake had a very good flavor and the texture of the filling was almost custard like. Both Kevin and I enjoyed this cake for its unique texture and vanilla flavor. We did note that it was a bit sweet. I thought the addition of some sort of berries when serving would cut some of the sweetness. One of my favorite chefs on The Food Network is Paula Deen. She is famous for her Gooey Butter Cakes in all flavors. Her recipes, however, all are made with a cake mix for the crust and include cream cheese in filling. At some point in the future, I will make her version and compare the two to determine which is the better one. 1. In a medium bowl, combine 1 cup flour and 3 tablespoons granulated sugar. Use a pastry blender to cut 1/3 cup butter until mixture resembles fine crumbs and starts to cling. Pat mixture into bottom of a 9X9 inch baking pan; set aside. 2. For filling: In a mixing bowl, beat 1 ¼ cups granulated sugar and ¾ cup butter with an electric mixer on medium speed until combined. Beat in corn syrup and egg just until combined. 3. Add 1 cup flour and evaporated milk alternately to beaten sugar-butter mixture, beating until just combined after each addition (batter will appear slightly curdled). Pour into crust-lined baking pan. 4. Bake in a 350° degree oven about 35 minutes; or until the cake is nearly firm when u gently shake it. Cool in pan on a wire rack. If you like, sift powdered sugar over the cake before serving. My good friend Jeanne typically can NOT cook. She can, however, make THE best stir-fry rice. This morning she dropped off a fresh batch for us. So, tonight I made grilled chicken tenders marinated in hoisin, Jeanne's stir-fry rice and our favorite broccoli dish. If Broccoli in Garlic and Hoisin was the only way to eat broccoli, I would be in heaven! The broccoli is gently blanched and quickly stir-fried with oil, garlic, and hoisin until it has a slight crust. 1. Fill a large stockpot with 8 cups water and bring to boil. Cut broccoli into florets and cut stems into bite-sized pieces. Blanch broccoli for one minute then drop into an ice bath immediately. Drain and dry on a paper towel. 2. In a large skillet or wok, stir-fry the broccoli, garlic and ginger in oil for 2-3 minutes until broccoli is crisp tender. Add the water, hoisin sauce and salt. Cook and stir until sauce is thickened. Parsley is probably the only herb considered to be indispensable by most Western cooks, parsley is a biennial (lasting two years). Parsley is native to the eastern Mediterranean region. 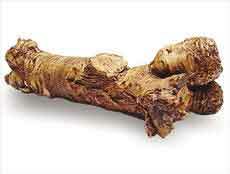 Parsley root which is valued for its root rather than its leaves, was first grown in Germany in the 16th century. Parsley root tastes like a combination of parsley and celery. Parsley is known for its clean, fresh taste and it is rich in iron and vitamins A and C. It is used in sauces, salads, stuffing, and omelette's in many parts of the world. Adding chopped parsley to the end of the dish preparation will add a fresh flavor. Parsley is a required herb for the French bouquet garnis, Italian gremolata, salsa verde, and tabbouleh. The herb matches well with eggs, fish, lemon, lentils, rice, tomatoes, and most vegetables. The herb pairs well with the following herbs: basil, bay, capers, chervil, chili, chives, garlic, lemon balm, marjoram, mint, oregano, pepper, rosemary, sorrel, sumac, and tarragon. I work at a small private college and Ashley, one of our great student workers, brought in these cookies and the recipe. Ashley's mother was nice enough to share the recipe with us. Ashley is one of the best student workers that we have had since I have been in the office. Thanks to Ashley for doing a great job and a big thanks to Ashley's mom! These cookies have been around for a long time. My aunt "Meenor" said that my grandmother used to make these when she was a kid. I am just surprised that I have never had these before. But, I can tell you that these will be one of my go-to cookies! 1. Cream together butter, sugar, and vanilla. 2. Slowly add the flour to the butter mixture. Mix but do not over beat or the cookies will be tough. 3. Slowly add the crushed potato chips. 4. Bake at 350 for 10-15 minutes or until slightly gold on the edges. Tonight's dinner was courtesy of Julie B-C, a co-worker of Kevin's. We have been to several parties where Julie has brought dishes and each and everyone have been outstanding. Julie is a great lady. One of the most genuine people we know. This salad has just the right amount of sweet to heat. I needed to make some minor adjustments since some of the ingredients were not available locally. I will share the recipe as written. My modifications included regular peas for the snow peas, dried apricots instead of the raisins/currants, and I added chopped tomato. Either way....this salad is a must try for summer! 1. Bring chicken broth to a boil in a medium-size saucepan. Stir in couscous, parsley, and thyme. Remove pan from heat, cover and let stand for 5 minutes until broth is absorbed. 2. Meanwhile, in a large bowl whisk the lemon juice, oil, curry powder, black pepper and crushed red pepper. Add cooked couscous and toss to coat. 3. Add snow peas, chiken, scallions, green pepper and raisins. Toss to mix well. 4. Cover and refrigerate at least 1 hour. Sprinkle with nuts just before serving. An easy weeknight appetizer for the summertime couldn't be any better with the combination of French bread, fresh mozzarella cheese, vine-ripened tomatoes, and fresh basil leaves. As I type this entry, my mouth is starting to water and we just had this last night. 1. Slice 6 slices of French bread about 1/2-inch thick and toast lightly. 2. Lightly drizzle with Balsamic vinegar and olive oil. 3. Sprinkle lightly with kosher salt. 4. Add slice of mozzarella cheese. 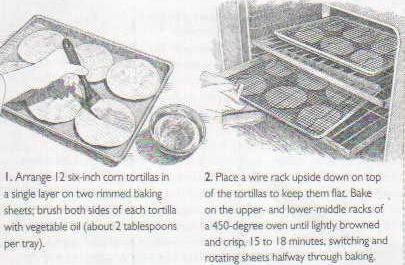 Baking tortillas to create tostadas uses much less oil than the traditional approach of frying and produces comparable results. This will save you time and extra calories! Make sure you start out with corn tortillas that have no preservatives. They should have three simple ingredients: corn, lime, and salt. The baked tostadas can then be served with refried beans or shredded meats. My good friend and canning buddy, Linda used to live in the country on a few acres. She was the one who taught me how to can and put up vegetables. One summer we found wild horseradish around her property and decided we would put up a few dozen pints. Out came the blender, vinegar, and salt and a few hours later we had some of the best horseradish I had ever had. Nothing beats fresh and homemade. Well, Linda does not live on the property anymore and we do not have access to the wild horseradish but we still craved that fresh grated, robust flavor. I am of Polish descent and Kevin is of German descent and we LOVE horseradish. While at a market in Chicago a few weekends ago, I found a fairly large horseradish root and thought I would pick it up and put up a few pints. This morning I started grating the root on the regular side of a box grater and discovered why all of the European women in old photos were always grimacing. It was because they were grating horseradish. I got about 1/3 of the root grated by hand and could not handle anymore. My nose was running and my eyes were watering so badly, I could not keep them open. I remembered when Linda and I made it last time, we grated it in the blender as we were preparing it. So, I got the blender out and finished the remaining root that way. Ahhhh, no more tears. While the blender produces a finer end result, the taste and potency of the horseradish is still the same. In the end, a one pound horseradish root produced 2 pints of prepared horseradish. And, the tears stopped about 1/3 of the way into the process. Horseradish could not be easier to prepare. Grate the horseradish root on the coarse grate side of a box grater. For every 1 cup of grated horseradish, add 1/2 cup distilled white vinegar and 1 teaspoon salt. Place in a clean 1 pint jar and seal tightly. or add chopped root with vinegar and salt to the blender and blend until finely grated. If using the blender method, a one pound root will require about 1 1/4 cups of vinegar and 2 1/2 teaspoons salt. Chop the root into 1-inch pieces and place in the blender with the vinegar and salt. Pulse or set the blender on the grate setting and process until desired consistency is achieved. Store in the refrigerator for up to one year. Note: The longer the horseradish sits, the stronger the flavor will be. Lately, we have been on a soup kick. Last weekend, I made a hearty lentil and bean soup. The great thing about soups is that you really can't go wrong with the ingredients. It is based merely on your taste and what makes you feel good. Feel free to substitute sausage or beef for the chicken in this recipe. 1. Prepare lentils and beans as directed on the package. 2. In a large stock pot, saute bacon and onions over medium heat. When onions are soft, add the chives, salt, pepper, and thyme. Saute for 5 minutes. 3. Drain lentils and beans and add to the stock pot. 4. Add the chicken breast. 5. Add white wine, chicken broth, and stewed tomatoes. Simmer for 45 minutes until beans are tender. 6. Add cayenne pepper to taste. Called the "king of herbs" by French cooks, tarragon is the main flavoring in many of the sauces that are basic to that country's classic cuisine. In ancient times, the Greeks used tarragon as a remedy for toothaches. Tarragon is known for its anise-like aroma and taste, which can easily overshadow other flavors in a dish. The narrow-leafed herb can be used fresh or dried. It is also preserved in vinegar for a tasty condiment that perks up salad dressings and homemade mustard. 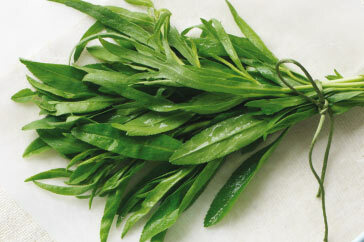 Tarragon's dark green leaves can be used fresh in salads and sauces or as a garnish. The dried herb enhances fish, chicken, and egg dishes as well as a variety of vegetables such as potatoes, carrots, broccoli, and beets. Adding tarragon toward the end of cooking brings out its maximum flavor and avoids its bitter side. Did you know that for every pound of dried beans a recipe calls for, you will need 58 ounces of canned beans! As a cost saving tip, always have bags of dried beans on hand! Plus, nothing beats the taste of all-natural products when possible. This past weekend Kevin and I were down in Milwaukee to do some shopping and had heard from one of his coworkers about a bar and grill located in the historic 5th Ward. Stack'd is located at 170 South First Street amidst blocks of unique shops and boutiques. Stack'd specializes in build your own burgers served on pretzel rolls. Now, granted the delicious beef was grass-fed but the WOW factor in these burgers came from those buns. The shiny, dark brown crust on the bun had pure pretzel flavor from your first bite. The bun was not salted and was very tender. I ordered my burger with thick slices of raw red onion, lettuce and some of the tangiest bleu cheese I have had in a long time. Kevin had his burger with grilled onions, lettuce, and tomato. Your burger comes with a side of your choice. In our case we both are mac-and-cheese lovers so that is what we ordered. They serve Twisted Mac and Cheese, a great combination of white cheddar, smoked Gouda, and a small addition of bleu cheese. This blend of cheeses was perfectly balanced. If you are a mac and cheese lover, definitely order this one. We also orderd a side of onion rings which were perfectly cooked. The trick to a great onion ring is when you bite into it, the remainder of the onion stays inside the breading and not come out in one long string. Stack'd had some great onion rings. They were served with a superb BBQ aioli. Now, this was the third star of this restaurant in my opinion. They make their own BBQ sauce which is a Carolina vinegar based sauce and mix it with a mayonnaise and serve it as a side dipping sauce for the onion rings, salmon cakes, and their pulled-pork sandwich. Our meal consisted of two build-a-burgers, order of onion rings as an appetizer, and the 3 can of Blatz beer for $5.00 special. Our tab was just under $30.00. Now, we don't eat like this all the time but once in a while, you have to splurge. The pretzel buns for the burgers alone were worth the price! If your in the downtown area of Milwaukee anytime soon, please stop at Stack'd and have a pretzel roll burger!